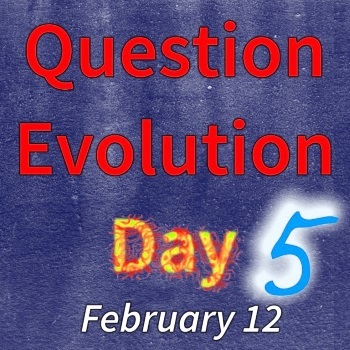 To celebrate the fifth annual Question Evolution Day, I thought it would be helpful to revisit a logical fallacy that is often used by the Darwinistas. It should be well understood that science thrives on challenge so that a hypothesis or theory can be revised when unsupported by evidence — or discarded entirely. 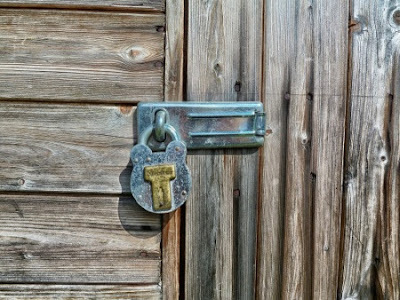 Unfortunately, evolutionary owlhoots often try to lock away contrary evidence, especially when it points to the Creator. Can't have that, it interferes with naturalistic presuppositions. Among the logical fallacies that anti-creationists employ is the fallacy of exclusion. (For an earlier article with a funny video I did on this subject, click here.) This fallacy has variations and different names, including cherry picking, suppressed evidence, card stacking, incomplete evidence, and more. Many people believe in scum-to-scientist evolution because they are simply not given all the evidence. Making a conjecture sound plausible is common in the evolutionary community (especially its press), and people get mighty surprised when creationists give them information that was withheld. People tend to "fill in the blanks" when they do not have enough information and they have their own biases. There's a commercial in the US that shows a man talking on the telephone at 3 AM, and his wife assumes her husband is cheating on her. She filled in the blanks from limited evidence and assumptions. Believing evolutionary stories can seem reasonable, but you don't have all the evidence. This brings to mind Proverbs 18:17. Here is a bit of humor to emphasize the point. Know any other creationist writers that have used the Three Stooges? Here's a bit of background trivia. The act began in the late 1920s, using Shemp as one of the Stooges. He left the act, and Curly took over in 1934. Curly got sick and never recovered, so Shemp came back into the act. I'll leave the rest of the history out of this, because the bit I'm focusing on is the 1949 short, Malice in the Palace, which fell into public domain. (Sony made a colorized version, which is under copyright.) We have an excellent example of people filling in the blanks. They see Larry holding a meat cleaver and carrying a dog and a cat at different times, hear chopping noises and animal yelps, and make unpleasant conclusions that seem entirely reasonable. After some further slapstick silliness, the rest of the evidence presents itself and the people abandon those conclusions. Think you know the whole story about evolution evidence? Not hardly! That's where biblical creationists come in and give information that is withheld. Now, here's the funny Three Stooges bit, edited down from the original 15-1/2 minutes to 5-1/2 minutes. Watch them flinch during the chopping sounds. Then there's an excellent music video by ApologetiX afterward. It's kind of fun to give a bit of background information, and I believe that people like some of the personal stuff. Whenever something is submitted for publication, it needs to meet guidelines, and is subject to editing. (Probably the only "pure" way to get your content exactly the way you wrote it is to put it on your own Weblog.) I have thousands of posts and articles on my own Weblogs, but have had only a few published by organizations. Aside from letters to newspaper editors, I think my first publication was in the May 1991 Bible-Science Newsletter (PDF scan available here), which is now Creation Moments. Surprisingly, that one was published "as is". Other items I wrote for people that were edited, and even had some collaboration, such as at 101 Arguments. My submissions to Michigan Bicyclist Magazine in the late 1990s had a mix, some were edited, one was mostly "as is". Another printed publication was so heavily edited that I barely recognized it! Another printed publicationThere was an article that I submitted to Creation Ministries International a spell back, and it didn't fit their needs. Reading it later, I realized it was a good thing they passed on it. This time, they accepted my article. Yes, there was some editing, including improvements and some added content. I'm pleased with the final outcome. If you want to see that, click on "The Importance of Question Evolution Day — A grassroots movement that anyone can support". So, there you have it. When you submit for publication, you need to meet guidelines, have content that they like, and you can expect editing. As for me, perhaps I'll be able to submit material for publication and actually get paid for it. But I'll still submit unpaid material for causes that I believe in.